You know those movies that center on the magical possibilities of food? The plot revolves around the way a good meal can make people fall in love or see the world in a whole different light. I am thinking of Babette’s Feast or Like Water For Chocolate. Well, Sarah Hendler’s story has the same spirit with a jewelry twist in the plot. Born and raised on the Gold Coast of Long Island, New York, Sarah relocated to Los Angeles to pursue a career in film. She worked on any number of movies as well as produced a few shorts creating quite a list of credits to her name, before she met and fell in love with her future husband, chef Vinny Dotolo. This is where the food part comes in. Vinny and his partner Jon Shook are culinary visionaries. 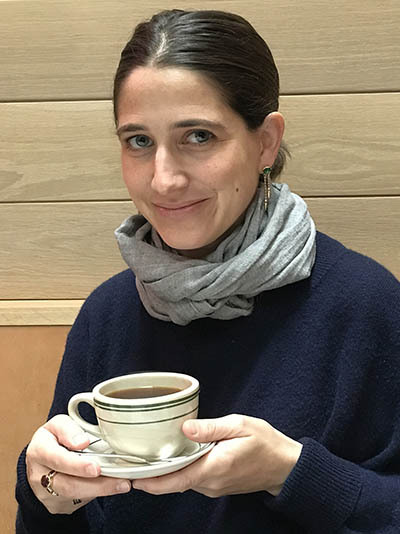 Sarah worked with them as they took took the LA food scene by storm opening up a handful of restaurants that instantly became cult favorites—Animal, Jon & Vinny’s, Petit Trois, Son of a Gun, Trois Mec, and Trois Familia. Flash forward several restaurants and a couple of kids later, Sarah realized her professional path going forward was not going to be a producer of movies. She was going to pursue her creative passion for jewelry. My theory is she realized her heart’s true desire, being surrounded by the soul with which the food was made, but I could be taking a little artistic license with the narrative. Sarah grew up in a family of women who loved the art and craft of jewelry. Her maternal grandmother knew David Webb as in the man himself. When she visited her mother in New York, jewelry was often part of their activities. 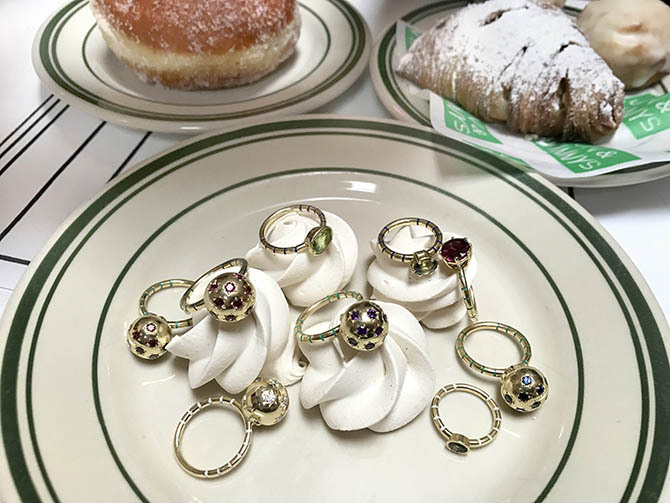 They enjoyed going to exhibits such as the 2011 Cooper Hewitt show Set in Style: The Jewelry of Van Cleef & Arpels and the 2014 retrospective for Verdura’s 75th Anniversary. 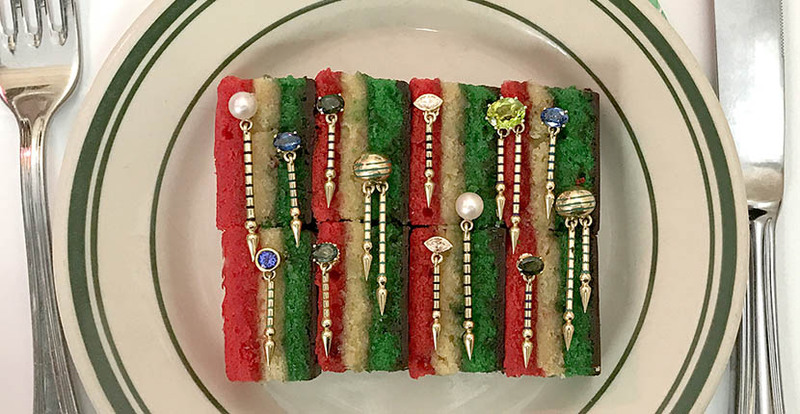 Sarah began in jewelry by curating vintage collections sold in specialty stores. She made a few vintage inspired designs then launched her first full collection in 2016. It is all manufactured in Los Angeles. The main sources of inspiration are the jewels of her grandmothers, Shirley and Ethel, mixed in with a serving of Sarah’s modern style and good dose of verve. “The starburst ball collection is named for Ethel, because she loved a big cocktail ring!” explains Sarah. 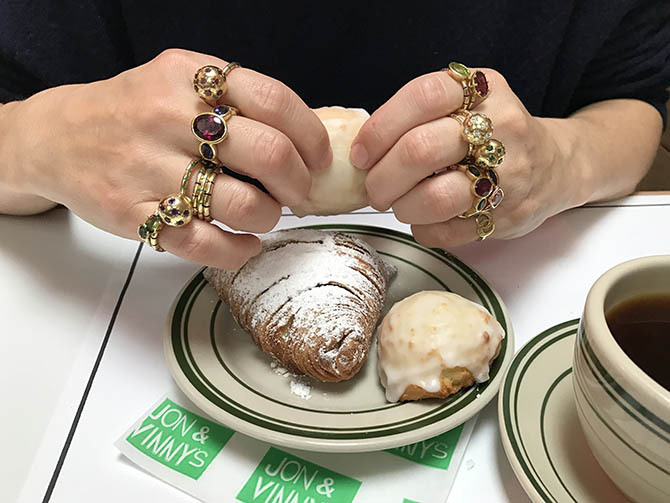 “My version has elements of Victorian jewelry such as burnished stars in gemstones and diamonds but with a new, bold scale and surprising enamel touches.” Variations on the collection include gold and enamel striped bands and rings with an oval center stone. There are also gem-set band rings set with a center stone. The daring colors Sarah mixes and matches in the jewels are carefully chosen. “We send Pantone colors to the enamellist to get the details as matched up as possible,” explains the designer. Her experience with vintage jewelry shines through in the amazing details of the designs like the rounded prongs around the stones and other sculpted components. One of the first celebrities to wear the earrings was none other than Madonna. 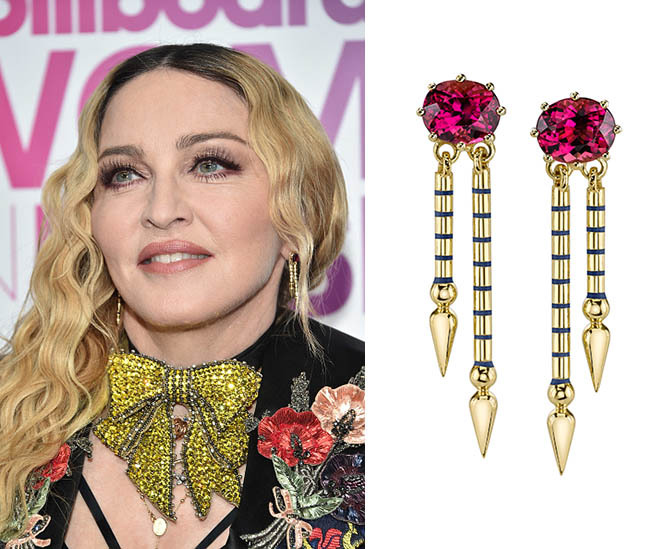 The icon wore Sarah’s One-of-a-Kind Rubelite Shirley Earrings when she accepted Billboard’s 2016 Woman of the Year Award in December. This moment was followed by another major red carpet appearance. 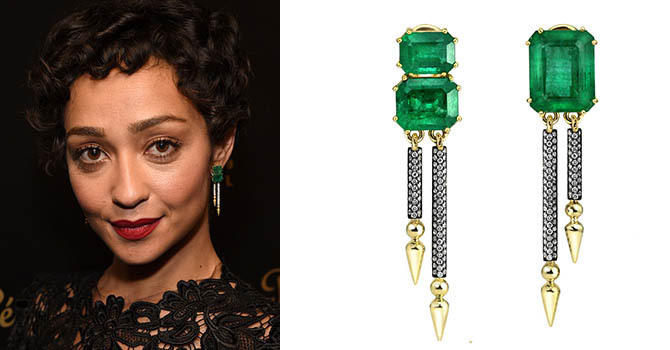 The undisputed style star of Awards Season, Ruth Negga wore a custom pair of Sarah’s Shirley spear earrings set with Gemfields emeralds and diamonds to the 2017 Santa Barbara International Film Festival in February. There is no doubt there will be a lot more beautiful celebrity moments for this rising jewelry design star. As she continues to blend her signature motifs into new recipes it is going to grow into a feast of a collection.